Can You Clean a Toilet Bowl With Plain Bleach? The main ingredient in many commercial toilet bowl cleaners is sodium hypochlorite -- otherwise known as bleach. The main difference between cleaning with a commercial cleaner and using plain bleach is that the commercial cleaner has thickening agents to keep it on the slippery porcelain so the bleach can do its job. You don't have to use bleach to clean your toilet -- vinegar also disinfects, and it removes stains better than bleach. 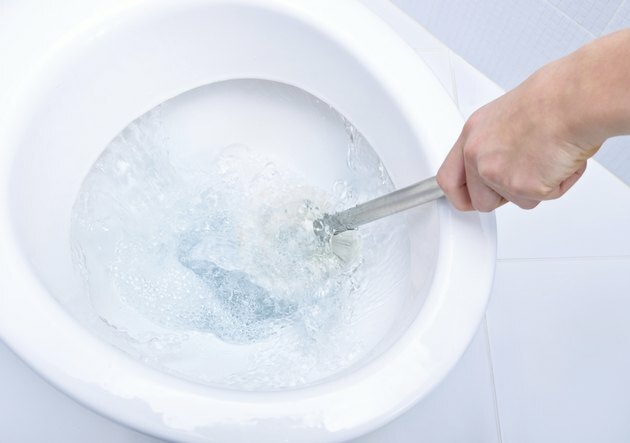 A man's hand using a brush to clean a toilet bowl. Bleach is both a cleaning agent and a disinfectant, although it won't remove mineral stains caused by hard water. It can be dangerous if used in high concentrations -- the recommended concentration for cleaning in the bathroom is 500 parts per million, which amounts to 2 1/2 tablespoons of regular 5.25 percent household bleach per gallon of water. This may seem like a low concentration, but it's one that will do the job without causing damage to your skin, eyes or lungs. Always use bleach by itself -- if you mix it with other cleaning agents -- especially ammonia -- it can produce poisonous fumes and cause serious skin burns. To clean your toilet bowl with bleach, start by putting on rubber gloves and opening the window to ventilate the bathroom. Fill a spray bottle with water and add enough household bleach to produce a solution of 500 parts per million. You need a toilet brush free of bacteria, so immerse the brush in the same bleach solution before using it. Flush the toilet, then spray the sides of the bowl and the underside and top of the rim and seat and scrub. Rinse the areas you scrubbed with clean water, then spray the rim and underside of the seat and wipe them with a sponge. Give everything a final rinse with clean water. Although it's dangerous to mix bleach with acidic or alkaline cleaners, you can safely add a drop of dish-washing soap to the spray mixture. This helps the spray loosen stubborn urine stains and other deposits that collect on the back of the rim and on the underside of the seat. If your toilet bowl hasn't had a good cleaning for some time, scrub the porcelain and seat with baking soda before you treat it with bleach. Baking soda is a mild abrasive that deodorizes as well as cleans. After completely rinsing the baking soda off with plain water, use the bleach spray to clean more deeply and disinfect. White vinegar disinfects as well as bleach and it's safer to use; you can safely spray it full-strength if you want. Besides disinfecting, the acetic acid in vinegar can dissolve mineral stains on the sides of the bowl, but it has to remain in contact for an hour or two. One way to keep it in contact is to make a paste with vinegar and borax. Spread the wet paste generously on the inside of the bowl and spray it periodically with vinegar to keep it wet. When you wash the paste and stains away, scrub the bowl with vinegar and rinse it with clear water.